Summer heat getting to you? Chill out with these frosty popsicles that play by the nutritional rules. Call it part cooling effect, part nostalgia. Who doesn't love a cold popsicle when temperatures are soaring? But deep down you're probably wishing there was a way to beat the heat other than the too-sweet concoctions you get from the grocery store freezer case. Don't sweat it. Popsicles can be so much more than a frozen sugar bomb. 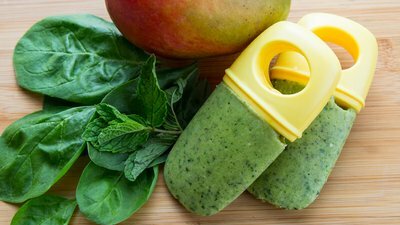 To give pops a fitness-friendly makeover, break out the blender and popsicle molds to make your own. These sophisticated sub-zero heroes aren't just delish treats on a hot summer day, they're also health food on a stick. Getting your protein has never been so cool. It's time to take your java out of the mug and into a popsicle mold. Naturally sweetened with dates, these ice pops taste like a fancy coffee drink but with way more nutritional credibility. You'll be hard pressed to find frosty pops with more nutritional heft than these. Hemp seeds add a dose of plant-based protein and essential omega fats, while the mild-tasting baby spinach adds a dose of antioxidants. Use a plant-based protein powder if you want to keep these pops vegan or dairy free. Pineapple could also stand in for mango, and the mint can be replaced with fresh basil. After a sweltering summer workout, these pops are just what you need to cool off inside and out, while simultaneously kick-starting the recovery process. The protein-packed trio of cottage cheese, antioxidant-rich blueberries, and almond butter gives you the nutrients your body needs to take the heat.